Or to take your hands off the keyboard and by not typing end it. Tis a crash devoutly to be reported. When you have shuffled off of this meta coil. The other night, after the show in the SpinDome, an avatar was there who went through his many wonderful and beautiful “selves”. As I looked at this person transforming himself from an alien to a griffen to magical dragons, I realized his form while changing was essentially the house of something that remained true. Yes the house we have our soul in whether in body form with fingers typing at the keyboards, or here as we speak, is still well, us. But what lies underneath, I guess it is our soul. It doesn’t really matter what the outside is, I realized as I looked at this avatar, we are who we are inside. 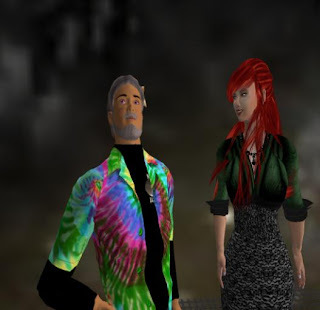 Perhaps we love SecondLife because we can also breathe a different form to life, and in one that more closely resembles who we fell we really are. Our soul is our own though, our inner self always there - the one we carried with us into this life, second or othrwise. And what we do with our souls while we manifest them onto whichever plane we are on impacts how that soul devlops. How we touch other people also tells us what of our soul reaches forth beyond the confines we house. We do not live just for ourselves alone in this world and we thankfully have the chance to reach out beyond the single self we do have. We can enchant eachother, teach each other and also transform one another. In so doing we grow and also transform ourselves. Not a bad package to have access to. Of course we can also at times hurt each other or over step the boundaries. In a respectful world, we try to pull back. Again it is the will of my soul to not want to cause yours pain. For those who do hurt intentionally, do so with the horror of hurting themselves. Damage is never just impacted to the external, but to the internal as well. While we change our form we essentially remain true to who we are. We can do what we can to enrich our own being, but I guess we also have the great and wonderful responsibility to help each other too. 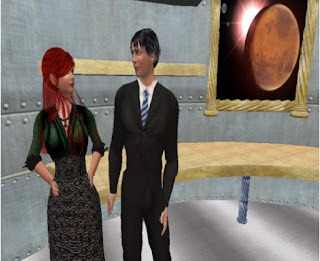 SecondLife lets us reach many people who we would normally, in the course of one human day never reach. And we come here because its beautiful and fun, impressive to see what others have done yes too. We can only imagine what we alone can fathom. But we can also learn from others, as no one knows everything. (I mean no one can really, where would you put it?) So you show me something and I show you too, together and separtely we grow and hopefully evolve into better people. We still carry tha soul inside us even if we are red or blue or green or pink or brown. However we are, we make an impact upon one another. It can’t be for naught, and we know this I think instinctively. And we want to be here, for so very much. Time rushes when we are inworld, The minutes stretching vastly to hours in ways we could never have imagined we would devote to our virtual beings with our everlasting souls clinging gracefully to them. And because we do want to be here so very much, we set ourselves with things we “must” do. I have to come online to write or to get panelists, to check the set, etc. Others have to do what they must to get their virtual lives in order. And because we want to be here, I think we set the things we do as things for others because then we can justify all the time we spend here better to ourselves. It is and has become a world of mutual enrichment Because otherwise we couldn’t explain why we spend so much time here. For a greater service we can, and so we do. That reflects well on us, and consequentially on the souls which we will take undoubtedly with us when we shuffle off this virtual coil, whether by logging out for the day, of for eternity.